Craig Manister’s paintings are found during the act of painting with largely unexpected outcomes. In invented landscapes he continues an investigation that began with paintings in the tradition of modernist abstraction, containing a strong feeling for surface and the pictorial expansion of forms across that surface. Allowing paint its own authority, brush strokes describe objects and spaces as they maintain integrity as marks. The landscapes are vehicles for exploring the perception of space and the pursuit of a coherently organized picture in the classical tradition. The aim is to get all the parts of a painting to work in tandem, with a similarity of painterly density, a unified structure of compositional rhythms, and a resultant overall atmosphere of serenity. Manister has shown work at the National Academy Museum, Beijing Art Institute, Mei Shu Guan Art Museum, Elizabeth Harris Gallery, NY Studio School, Staten Island Museum, Newhouse Center for Contemporary Art, Ober Gallery, Nielsen Gallery, Sideshow Gallery, Farleigh Dickinson University, Wagner College, and Queensborough Community College Gallery. 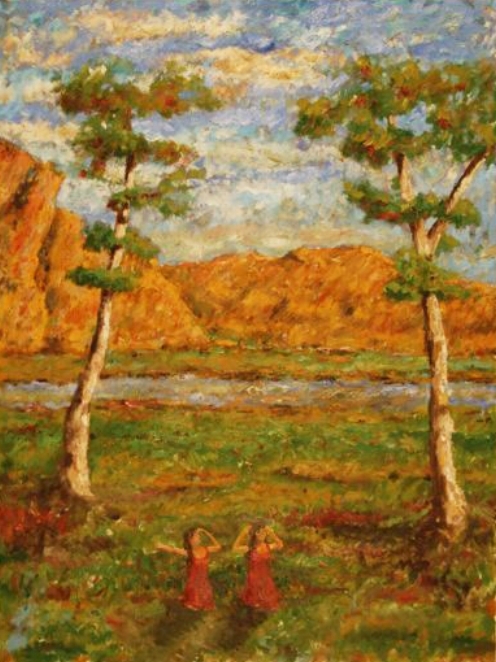 He recently curated a show of the work of Earl Kerkam for The Painting Center. Manister teaches at the College of Staten Island, City University of New York, where he is Director of the Gallery of CSI.